Wheat Flour (Wheat Flour, Calcium Carbonate, Iron, Niacin, Thiamin), Brown Sugar, Pasteurised Whole Egg Powder, Ground Ginger, Raising Agent (Sodium Bicarbonate). Store in a cool, dry place and once baked in an airtight container. Cooking time: 5-10 minutesMakes: 6 BiscuitsMethod: OvenYou will need:40g softened, unsalted butter; 15-20ml (3-4 tsp) cold water; 30g golden syrup, plain flour for dusting, gingerbread man shaped biscuit cutter; baking tray.Method:1. Pre-heat the oven to 190ºC/ Fan 170ºC /Gas Mark 5.2. 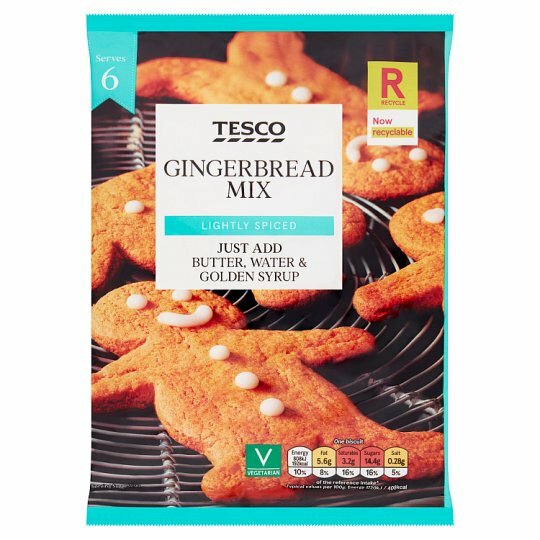 Empty the gingerbread mix into a mixing bowl and add the butter, water and golden syrup.3. Mix well to form a soft dough.4. Roll out the dough to 5mm depth on a lightly floured surface.5. Cut out the gingerbread biscuits using a shaped cutter.6. Place on a baking tray and bake for 5-10 minutes or until golden brown.7. Leave to cool on the tray for 5 minutes then move onto a cooling rack.All appliances vary these are guidelines only.ImportantNot suitable for microwave cooking.